FTE budget management is easy with direct access to view budget and vacancy statistics as well as employees assigned to that budget. You can also break down the budget by fiscal periods within the year to compare actual versus projected budget in each period. Our FTE Calculator allows you to configure alerts and password protection for anything that would exceed budget: requisitions, changing employee information or hiring a new employee that will result in exceeding the budget. A password override by an authorized person is then required to exceed budget. You can import budget data by fiscal year, department, position and period and/or a combination of these to allow you to accurately budget by FTEs and report on actual vs. budget data. What does FTE stand for? What does FTE Manager & Calculator allow me to do? 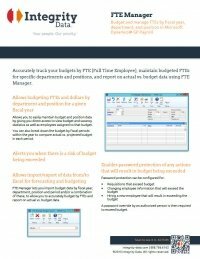 FTE Calculator enables companies to budget, manage employee FTEs by job for individual fiscal years/periods, and compare budget amounts to actual amounts in both dollars and FTEs. What prerequisites do I need in order to use Integrity Data’s FTE Calculator? 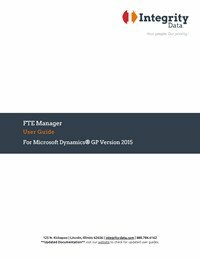 Our FTE Manager & Calculator software is compatible with Microsoft Dynamics GP Starter Pack. Click here to see what HR and Payroll functionality is included in your Dynamics GP license.